Fifteen Bronze Award Participants, including eight girls and seven boys of The Ardee School, Gurugram and NFC, Delhi completed their Adventurous Journey on 14th - 15th September 2018 under the supervision of Seema Chugh (Award Leader) and Atul Kumar Dhuria (Sports teacher). Parveen Bhatia (Award Leader) is sharing this report, a collective response by the Award Participants and the mentors about the Adventurous Journey that the participants undertook to Camp Wild, Dhauj. Both the Participants and their Leaders had much to share on how this journey became a landmark in the Award journey of the participants. This Adventurous Journey has truly been the highlight of our Award journey. The first day saw us engaging in myriad activities like flying fox, rock climbing, rappelling, dealing with army obstacles, cooking and trekking at night. The day commenced with some fun team building activities, which were then followed by other more thrilling activities. Initially, fear and anxiety had gripped us and we were paid back in wounds and bruises for our physical labour. But eventually, we did overcome the challenges and accomplish the tasks. 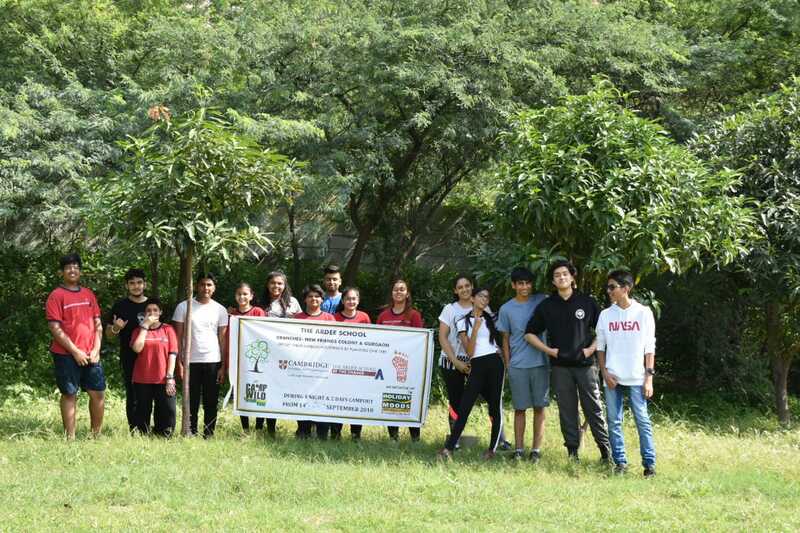 The second day of the journey unfolded with a 5-kilometre trek to Aravalli Hills. Being able to complete this too, our hearts were filled with the exhilaration of victory. The day and the journey both concluded with a tree plantation activity. The joy of persistent attempts leading to accomplishments has been overwhelming for us in this journey. While we were doing our tasks, the grips of many of us loosened. A lot of us tripped and fell too. But what kept us going was the will to finish what we had begun. In activities like rock climbing and trekking, we could feel surges of adrenaline in our bodies that filled us with a sense of adventure. These tasks not only aided us in overcoming our fears but also in discovering parts of ourselves that we never knew had existed before. Detaching ourselves from books and gadgets, which had always been a strenuous task, seemed accomplishable in the journey. However, one of the most enlightening aspects of the journey has been the tree plantation activity that we undertook as a mechanism to create awareness among the locals about the environment. This report was prepared on the basis of the reflections received from Inika Sharma, Pushkar, Vaanya Ranade, Yahub, Krisha Agarwal, Priyanshu and Ananya Sharma (Award Participants).